The theme of the conference was ‘Broadband - A catalyst for Sustainable Economic Development and Promoting Digital Inclusion’. As such, the Siyakhula Living Lab (SLL) researchers and funders looked upon, with pride :-) as SLL was prominently featured in the Welcome Function video, as an excellent example of an initiative lying within the conference theme. 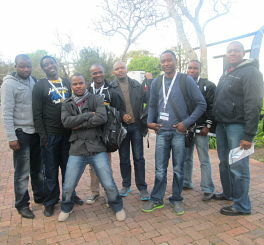 SLL researchers from Fort Hare and Rhodes Universities also showcased 8 of the 25 posters and 9 of the 89 presentations. They had the opportunity to engage with industry, especially Telkom South Africa and Saab Grintek Technologies that support the Siyakhula Living Lab work. 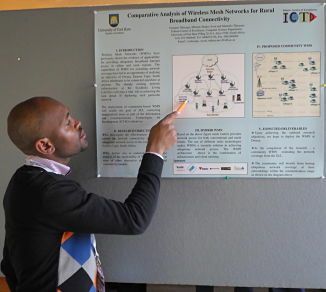 The researchers were accompanied by Prof Mamello Thinyane, the Fort Hare CoE Head and Ms Nyalleng Moorosi, a Lecturer in the Fort Hare Computer Science Department.